It was around 5pm this evening that I happened to glance out of a window on the western side of the building, immediately struck by the pink and gold hues across the sky. I rushed to grab my phone, as the camera was elsewhere, and managed to quickly take a couple of photographs, before the magnificent light disappeared over the horizon. It felt symbolic somehow, and notable in the way that I had seen it before it disappeared, moments later. 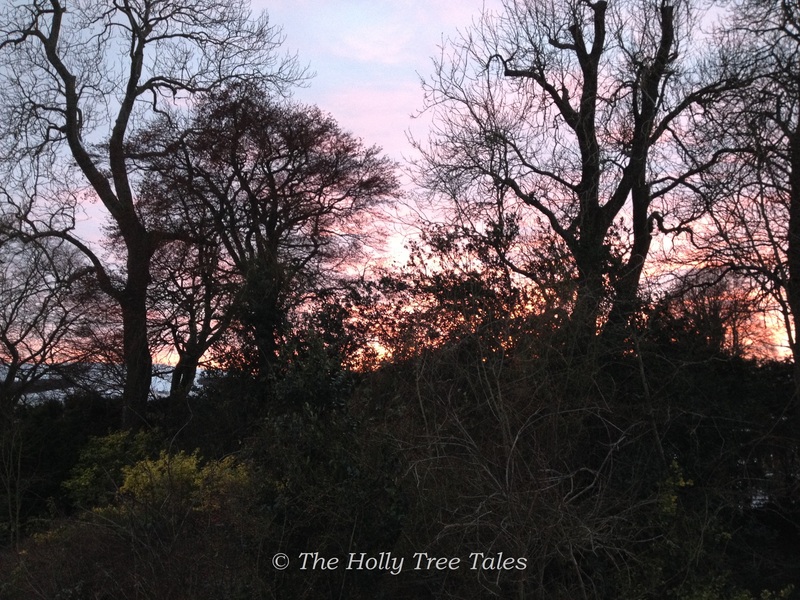 In the photo that I’m posting with these words, the light is behind the skeletons of many trees, overgrown shrubs and rambling roses, in their Winter state of undress … the few evergreens that are hidden in there, are holly trees and one or two conifers. The light is behind, and this to me is meaningful. It is so like the situation that I’m trying to crawl through in the building and writing of my blog, as well as other areas of life right now. There is light beyond … I just have to reach it. Today I discovered that somewhere someone had placed my name on a list of “Influential Women” – I was simply bemused, and then I laughed, and then I told myself not to get carried away, to take it with a bucket of salt, and then I realised that, even though the list is not something of great significance, I ought to be grateful that my name was on a list like that … I certainly am humbled by it, at any rate … and perhaps it was a little sign of something that is trying to manifest itself, something perhaps that the Universe has ‘up its sleeve’. Who knows? Today has been a special day for me, because I am one step closer to being more comfortable with ‘standing in my own power’, touched by the love of friends and the blessings that are all around me, in the hearts of loved ones around the world and in the positive energy of those who are once again in my life, or newly so. Each day I learn more how important it is to stand in the NOW, and to hold each moment as sacred in itself, seeing it as a wonder of life (as Thich Nhat Hanh might say), breathing mindfully, and knowing that all is well and is unfolding as it should. Such moments of wisdom become clear when one truly sees such a sunset. A magnificent sunset, captured through overgrown trees, shrubs and rambling roses.